La Bonne Vie - our chalet is exactly that -'The Good Life'. Situated on a quiet hilltop location with beautiful views across the valley and mountains, the chalet is on the outskirts of the village of Le Chatelard in the Massif des Bauges Regional Park. Le Chatelard is easily accessible by road but still remains unspoilt and retains a certain old world charm and authenticity. It is a quiet, friendly village with a supermarket, restaurant, tourist information, bank and post office and a small local food market every Friday morning held in the summer months selling locally produced cheeses, vegetables, linens and crafts. Les Bauges is an area of outstanding natural beauty, heritage and tradition and our chalet is the perfect base to explore a wide range of outdoor activities or to simply sit back and relax. If you are an adventure seeker, nature lover, walker, skier or cyclist you will find plenty to do in both the summer and winter months. The towns of Annecy, Aix-les-Bains, Chambery and Albertville are all within 30 minutes drive and whether you want to explore the many historical and cultural attractions in these nearby towns or you would rather explore the wine list at one of the local restaurants, La Bonne Vie strikes the perfect holiday balance and makes an idyllic escape for couples, friends and families alike. In winter enjoy low cost skiing at the local ski resorts of Les Aillons / Margeriaz and Le Revard and La Felcaz. These traditional resorts are perfect for families, beginners and intermediates or off-piste skiing for the more advanced. The chalet has a comfortable, contemporary open plan interior which easily accommodates 6 people. Entering the property through the front door you will find yourself in the hallway. There is a shower room off the hallway with shower, basin and WC. Moving through, you enter a fully equipped modern kitchen with fridge/freezer, dishwasher, oven and induction hob, combination microwave and all the usual cooking utensils and crockery. The kitchen looks out on the garden, fields and forest and the French doors open out onto a decking area which enjoys the sun from early afternoon until sunset, perfect for relaxing and enjoying al fresco dining. As you move towards the front of the property, the dining area to your right with its picture window, large birch dining table and chairs. To the left is the lounge with its ample seating including a large L-shaped sofa. The large floor to ceiling glass sliding doors have built in electric shutters. During the day the natural light floods in giving the room a bright and airy atmosphere. At night the shutters can feel closed and in winter a wood burning fire and under floor heating keeps you comfortably warm. Come down in the morning and, at the touch of a button, allow the light and views to flood in: what a way to start the day! The lounge / dining area open onto a balcony, the perfect place to sit and enjoy the great views across the valley and of the I imposing mountain Dent de Rossanaz. The chalet is equipped with a flat screen TV/DVD/Satellite for free UK channels (no access to French channels) & an iPod docking station with speakers. A selection of DVD's, board games and books are there for your entertainment. Upstairs there are three bedrooms, one double and two twin bedded rooms. The front bedrooms have superb views over the valley and the bedroom at the back overlooks the fields and forest. There is a bathroom with bath, overhead shower, basin and WC and heated towel rail. All rooms have electric heaters. On the ground level is a double length garage and ‘cave' with washing machine, tumble dryer and plenty of storage space for sports equipment, boots, bikes and skis (racks provided). We also have badminton rackets, beach rounders, frisbees etc for you to use. Relax on the sunny decking area in the garden and enjoy a barbecue, (garden furniture seats 6) or just watch the sun go down with a drink on the balcony. Free WiFi. Free logs, Bed linen, hand towel and tea towels are supplied. Cleaning at the end of your stay included. Bath towels available at £2.50 each. No smoking or pets please. Hi, We are Ian and Katie and we live in Kent. We love to travel and spend as much time as we can at the chalet. Ian is a telecoms engineer and a keen cyclist. Katie is a specialist teacher working with autistic children and their families. Our son is a freelance graphic designer and our daughter is currently living and working in London. We enjoy this area so much and we are happy to share our chalet and all that we know about the area with you. If you are looking for an alpine holiday with plenty to see and do or just a peaceful place to relax, we think La Bonne Vie is just the place for you. We have visited many regions of France over the years and were introduced to the Savoie region by some friends. We immediately liked the tranquil environment and the friendliness of the local Baujus and decided it would be the perfect place to escape to all year round for a chance to practice our skiing, indulge in the local cuisine, cycle on our tandem, go for walks (autumn is just perfect) or just relax and drink wine! Our neighbours have become our friends and our French is slowly improving. This is our home from home and we would like to share it with like minded people who enjoy nature at its best, outdoor pursuits, amazing scenery, a peaceful and relaxing environment. We built the chalet because we love the area and the views we enjoy from the chalet. Our chalet is kept to a very high standard, has all the facilities you would need and is spacious yet cosy. 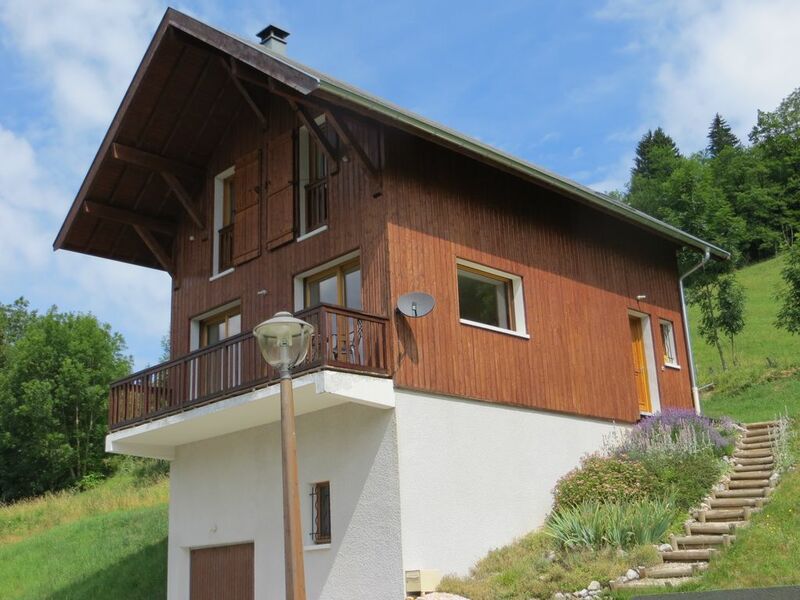 The chalet is in the village of Le Chatelard which is centrally located in the heart of the Massif des Bauges. Le Chatelard has the main supermarket (Carrefour) serving the region. Other village amenities include an excellent restaurant, a bar/pizzeria, a bank, post office, art/craft shops and a small weekly market. It is conveniently located for the many attractions to be found in Annecy, Aix les Bains, Albertvillle and Chambery, all within easy driving distance. The regional park is breathtakingly beautifully and has been described as 'an island of nature, where time is not an element'. You will feel you have stepped back in time and escaped the crowds. Ideally situated for the local ski resorts (and yet still only an hour from Orelle with its access to Val Thorens and the 3 vallées). A perfect base for walking, cycling, swimming and a host of other outdoor activities. For more information on these check out Terres d'Altitude or the Tourist Office both in the village. We love this area and we hope you will love it too! Upstairs: large modern bathroom with bath and over shower, wc and wash basin. Downstairs: shower room, wc and wash basin. Enjoys a panoramic, south-facing view of the mountains and the valley. The scenery is simply stunning and there are plenty of walking trails. Underfloor heating downstairs. Heated towel rail in upstairs bathroom. Electric radiators in all bedrooms. Linen and cleaning at the end of your stay included. Double length garage. Parking for two cars. Free WiFi via ADSL around 12 megabit. Bath towels provided at £2.50 each. Hand and tea towels provided free. For those cosy winter evenings. Logs included. Please empty ash daily. Modern induction hob. Instant control and easy to clean. Fully fitted modern kitchen. Well equipped with electric oven, induction hob, extractor, combination microwave, fridge/freezer, dishwasher, kettle, toaster & all the usual kitchen utensils & crockery. Access to all free UK channels via satellite. (No access to French channels). All free UK channels available only. No access to French channels. I believe if you subscribe to Sky you can bring your viewing card and use it in our box. A wide range of books available. A selection of board games. A selection of outdoor toys are available. A good selection of films. Large garden backing onto fields and forest. Perfect for admiring the views and eating breakfast as the sun rises over the mountains. 2 fantastic 18 holes golf courses on the shore of Lac d'Annecy (30km). One in Talloires on the Roc de Chère nature reserve with a panoramic view of Annecy lake and the Château de Menthon & one in Giez facing both lac d'Annecy and Mont Blanc. Perfect chalet for exploring the area. Clean, comfortable chalet with everything you need for a relaxing stay. A real home from home with stunning views. Chambery; Annecy and Aix-les-Bains all within easy reach. Thank you. We had a lovely week at La Bonne Vie. This is a beautiful area to explore and the chalet really made the holiday for us. Spotless and well equipped. Ian provided us with lots of helpful information about the area and responded quickly to our enquiries. Great chalet - would recommend! The chalet is very comfortable and absolutely clean. Ian has provided excellent information on how to get there and check in. It has everything you need and makes you feel at home. The view is fantastic. We had a car so Le Chartelard was a perfect base to hike the surrounding mountains and explore Annecy. We were only there for 6 days, we would have liked to stay longer. We highly recommend "La Bonne Vie". My wife and I spent the better part of three months living in La Bonne Vie. As others have written, it is a very well presented chalet with everything that one can need in a vacation home. It is a warm and inviting place to stay, with wonderful views from the dining area and the balcony. Enjoying breakfast as the sun lit up the mountains was a regular delight. Kitchen is well stocked with utensils, pots and pans, plates etc. Bedrooms are large and comfortable. Both the bathroom and the lower-level shower room are clean and hot water is plentiful. There is now high speed, reliable Internet that Ian and Kate had installed for us. Can't ask for better service than that. Generally, Ian and Kate are just great people to deal with. The neighbours are also lovely people, speak excellent English and always ready to help in any way that they can. The local Carrefour supermarket is in the village and has pretty much everything you need, including some excellent local wines and cheeses and, good baguettes and pastries. There is even a petrol (gas) station at the supermarket. Easy access to Aix-les-Bains, Annecy, Geneva and many world-class ski resorts. All in all, no hesitation in recommending La Bonne Vie. We would most definitely return if we head to the Alps again. The warm summers, clean air, low humidity and beautiful location make this the perfect location to enjoy many special interest holidays. The Massif des Bauges is a perfect place for walkers. There are many trails of varying difficulty, we challenge you to try climbing to The Cross on top of La Dent de Rossanaz opposite our chalet. With its beautiful and varied countryside this region offers a wide range of cycling itineraries of all levels of difficulty, from flat rides through river valleys to long alpine ascents into the heart of the Massif des Bauges. It is easy to see why these roads were chosen for the mountain finale of the 100th Tour de France. Mountain bikers can use the ski lifts at Les Aillons in July/August to take them up to Mont Pelat and La Rochettes and challenging downhills from Le Feclaz to Chambery and Le Revard to Aix les Bains. There are also plenty of family friendly routes - around the lakes in Leschaines and Annecy. This beautiful location will inspire all painters out there to get their brushes out and paint the flora and landscapes. Likewise keen photographers will be spoiled for choice, the geo park landscapes, the night sky, flora and fauna, its all there to be snapped. Other activities available are paragliding, canyoning, horse riding, fishing, climbing, forest adventure trails, lake swimming and even hiking with donkeys - it is all there on our doorstep! Fly/drive Geneva, Chambery, Grenoble. Geneva is the quickest way. Go to Skyscanner for prices and flight times from all airports: advanced bookings from £40 return. Easyjet is usually the cheapest. We are 1 hour from Geneva airport. To drive from Calais allow at least 8hrs. 565 miles. The 8.30am Dover usually gets us off at 11am French time and we arrive at 7pm for a quick supermarket shop (2 mins drive from the chalet). Le Chatelard is right at the centre of Les Bauges and is conveniently located for day trips to nearby places of interest: Les Aillons - 17km (20 mins). Margeriaz - 17km (20 mins). Aix les Bain - 30km (30 mins). Annecy - 30km (30 mins). Chambery - 45km (45 mins). Geneva - 60km (55 mins). La Plagne - 100km (1hr 20 mins). Valmorel - 80km (1hr 20 mins). Les Arc - 110km (1hr 40 mins). Grenoble - 125km (1hr 25 mins). Chamonix - 140km (1hr 45 mins). There is a Carrefour supermarket in Le Chatelard. If eating out, Les Clarines restaurant provides a wonderful savoyard dining experience and is very popular with the locals, top tip - book in advance. For Sunday lunch try the hotel in Jarsy - just 3km away or for a taste of real alpine food go to Mont Pelat restaurant at Les Aillons ski resort - 12 kms. Chez Cyrille in Le Noyer is also a favourite restaurant of ours. Catering Option – (Not usually available in July /August). La Bonne Vie is pleased to offer the services of a personal chef to help make your self-catered holiday a holiday for everyone. Melanie worked at the Michelin * Calcot Manor Hotel & has 10 yrs experience cooking for the luxury chalet market. If your have had a hard day on the piste or maybe it’s a special occasion: whatever the reason, why not put your feet up & let Melanie cook for you? Melanie can provide delicious home cooked meals from a selection of starters, mains, desserts, cheeses and wines. Meals can be cooked either in the chalet or delivered to you. Terres d´Altitude in Le Chatelard offers hiking, canyoning and via ferrata for the adventurous. There is horse riding in Lescheraines around the lakes and some excellent mountain biking routes. We have an English contact who can organize cycling tours & informal ski lessons if required. Plenty of walking opportunities and Maison Faune-Flore in Ecole will show you what plants, flowers and wildlife to look out for on your treks. The Tourist Office in Le Chatelard is most helpful and will help you book activities, spa treatments at Aix les Bain and excursions. The medieval city of Conflans on the outskirts of Albertville is an interesting place to spend an afternoon. Annecy attractions - lakeside village of Menthon with its fairytale castle, Benedictine monastery at Talloires, alpine garden at Semnoz. Local markets, superb restaurants, great shops and a boat trip around the lake. Booking Notes: £250 deposit required at time of booking. Refunded within 7 days of departure. Payment in full must be received no later than 8 weeks prior to arrival. La Bonne Vie has the right to apply cancellation charges as follows: More than 8 weeks before arrival - Loss of deposit. 6 - 8 weeks before arrival 50%. 4 - 6 weeks before arrival 60%. 2 - 4 weeks before arrival 80%. 0 - 2 weeks before arrival 100%. No smoking or pets in the chalet. Thank you. Changeover Day: Arrival after 3pm and departure by 10am - Sometimes we are able to be flexible: this usually depends on the time of the year. Notes on prices: Prices are for exclusive use of the chalet per week in UK pounds on a self-catering basis. Bed linen, hand towel, tea towels and cleaning included. Bath towels can be provided at £2.50 each.. Free WiFi Discounts available for 2 week bookings in low season, please ask.